Combine the lamb with the spices, chopped leaves, garlic and onion and mix well; season with salt and pepper. • Rub some oil on your palm, take little portions of the mixture in your hand and shape them up into small balls or koftas. 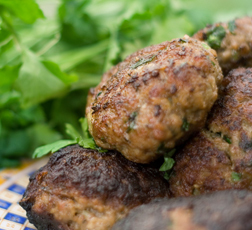 • Heat oil in a large pan over medium heat and brown the koftas until they are cooked thoroughly. • Serve hot with a wedge of lemon at its side or with an accompaniment of your choice.